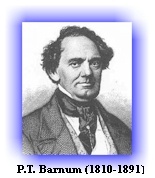 Phineas Taylor Barnum (1810-1891), known as P. T. Barnum, was the most influential American showman of the nineteenth century, and founder of the first important public museum and creator of the modern three-ring circus. Young men starting in life should avoid running into debt. There is scarcely anything that drags a person down like debt. It is a slavish position to get ill, yet we find many a young man, hardly out of his "teens," running in debt. He meets a chum and says, "Look at this: I have got trusted for a new suit of clothes." He seems to look upon the clothes as so much given to him; well, it frequently is so, but, if he succeeds in paying and then gets trusted again, he is adopting a habit which will keep him in poverty through life. Debt robs a man of his self-respect, and makes him almost despise himself. Grunting and groaning and working for what he has eaten up or worn out, and now when he is called upon to pay up, he has nothing to show for his money; this is properly termed "working for a dead horse." I do not speak of merchants buying and selling on credit, or of those who buy on credit in order to turn the purchase to a profit. The old Quaker said to his farmer son, "John, never get trusted; but if thee gets trusted for anything, let it be for 'manure,' because that will help thee pay it back again." Mr. Beecher advised young men to get in debt if they could to a small amount in the purchase of land, in the country districts. "If a young man," he says, "will only get in debt for some land and then get married, these two things will keep him straight, or nothing will." This may be safe to a limited extent, but getting in debt for what you eat and drink and wear is to be avoided. Some families have a foolish habit of getting credit at "the stores," and thus frequently purchase many things which might have been dispensed with. It is all very well to say; "I have got trusted for sixty days, and if I don't have the money the creditor will think nothing about it." There is no class of people in the world, who have such good memories as creditors. When the sixty days run out, you will have to pay. If you do not pay, you will break your promise, and probably resort to a falsehood. You may make some excuse or get in debt elsewhere to pay it, but that only involves you the deeper. A good-looking, lazy young fellow, was the apprentice boy, Horatio. His employer said, "Horatio, did you ever see a snail?" "I - think - I - have," he drawled out. "You must have met him then, for I am sure you never overtook one," said the "boss." Your creditor will meet you or overtake you and say, "Now, my young friend, you agreed to pay me; you have not done it, you must give me your note." You give the note on interest and it commences working against you; "it is a dead horse." The creditor goes to bed at night and wakes up in the morning better off than when he retired to bed, because his interest has increased during the night, but you grow poorer while you are sleeping, for the interest is accumulating against you. Money is in some respects like fire; it is a very excellent servant but a terrible master. When you have it mastering you; when interest is constantly piling up against you, it will keep you down in the worst kind of slavery. But let money work for you, and you have the most devoted servant in the world. It is no "eye-servant." There is nothing animate or inanimate that will work so faithfully as money when placed at interest, well secured. It works night and day, and in wet or dry weather. I was born in the blue-law State of Connecticut, where the old Puritans had laws so rigid that it was said, "they fined a man for kissing his wife on Sunday." Yet these rich old Puritans would have thousands of dollars at interest, and on Saturday night would be worth a certain amount; on Sunday they would go to church and perform all the duties of a Christian. On waking up on Monday morning, they would find themselves considerably richer than the Saturday night previous, simply because their money placed at interest had worked faithfully for them all day Sunday, according to law! Do not let it work against you; if you do there is no chance for success in life so far as money is concerned. John Randolph, the eccentric Virginian, once exclaimed in Congress, "Mr. Speaker, I have discovered the philosopher's stone: pay as you go." This is, indeed, nearer to the philosopher's stone than any alchemist has ever yet arrived.